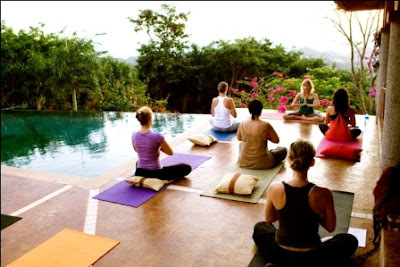 Last January I co-led a yoga retreat for women in Nicaragua, where I used to live. Leading retreats is possibly my most favorite thing to do! Our retreat this year runs MARCH 10-17th. Has a state of balance become the impossible dream of our generation? It seems that way to me—and to nearly every woman I know. I’m a 37-year-old pregnant mom who is forever trying and failing to strike a happy balance between my work life and my personal life, juggling a 55-hr-a-week career with marriage, motherhood, friendships, travel, bills, board meetings, cooking, exercise, phone messages, emails, tweets, facebook, housework, and the other exigencies of modern urban life. Most weeks I manage to make it to yoga, but I’m the gal who always arrives to class five minutes late, out of breath, half-clothed, lugging multiple wireless devices and at least three bags, and who realizes halfway through class that she’s still wearing her sunglasses. Which is why, last January, when I saw the flyer for a week-long yoga retreat at an organic farm in Nicaragua, I jumped on it. Here was an opportunity, however brief, to let the 27 balls of fire I was trying to juggle every day, including my husband and my daughter, fall to the ground and roll to a stop. Here was a chance to catch my breath, cease the rushing, soften the roughness, shed the responsibilities of my life – if only for a week. Here was a chance, I thought, to essentially do nothing in a gorgeous setting. As it turned out I did much more than catch my breath; I learned, among other things, a new way to breathe. It wasn’t from the doing nothing I had anticipated, but instead from fully engaging – in wilderness, in adventure, in exercise and spiritual practice, in a radical awakening of the senses. “Retreat” was not at all the right word for our experience in Nicaragua--it was a chance to step into life more fully rather than retreat from it. On a typical day I woke with the sun after 8 hours of sleep; ambled into an early-morning outdoor yoga class that coaxed awake every nerve and synapse in my body; ate a breakfast of fresh-picked tropical fruits, eggs collected that morning from the coop, and just-roasted coffee with generous amounts of milk still warm from the grass-fed cow. It took about 30 mins to recover from the sensory ecstasy of this eating experience, at which point I would prepare for an adventure that might entail galloping on horseback through howler-monkey forests, treasure hunting on beaches so pristine that they appeared pre-Columbian, swimming for hours in the sapphire hem of the Pacific. These daily adventures ended in the late afternoon, with just enough time to rest before the twilight yogaclass overlooking an oceanscape crowned by the setting sun, followed by a feast of fresh vegetables, fishes and meats. Sound implausibly idyllic? I haven’t even mentioned the 17 women who shared the adventure (exceptionally wonderful, all), nor the caliber of the yoga teaching (exceptionally high), nor the experience of volunteering at a local one-room school for disabled children (exceptionally moving), nor the physical setting along the southern Pacific coast of Nicaragua (exceptionally gorgeous, visit www.thriveretreats.com for images). There were, it’s true, a few elements that some might describe as less-than-idyllic—elements that literally came with territory, like large insects, some of them fist-size, including scorpions and tarantula. But these critters minded their own business, and you quickly came to accept them, like the howling of the monkeys, as part of the process of becoming truly awake to the natural world. The rooms we stayed in were beautiful but Spartan, with concrete floors and simple furnishings built from the wood on the farm. The experience was, in a sense, the very definition of the “state of balance” that has come to seem so impossible in our lives. A balance between luxury and simplicity, between action and stillness, between community and privacy, between living in comfort and living on the edge of something raw and wild. The next Women's Wellness Retreat in Nicaragua will be held MARCH 10-17th, 2012. Visit http://www.thriveretreats.com/ for more information. Prenatal Yoga...listening to your Inner Wisdom.